Make this beautiful classic dress which will become a wardrobe staple, from work wear to casual and evening wear. Using the Sewing Bees very own ‘Tilly & the Buttons’ Coco pattern, we guide you through the rights and wrongs of sewing with jersey and stretchy fabrics. Our teachers will help demystify and simplify, giving you tips and advice on how to get a professional finish with a domestic sewing machine. We will help you understand about overlockers* and coverlockers* and explain when you might want to invest in this sort of equipment (not required in this class*). You will also learn about sizing and using a commercial paper pattern correctly and how to copy your pattern and get a perfect fit. An excellent class if you are looking to up your sewing skills and have become reasonably confident in the basics on your machine. Sewing machines (you can bring your own let us know) and the pattern but you will need your own fabric. We do have a small selection of basic double knit colours’. 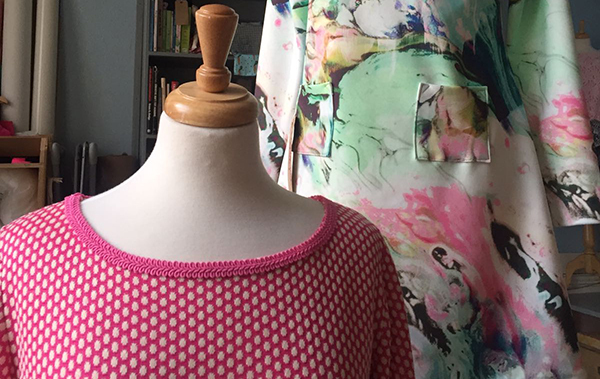 Once you have signed up you will get pattern and fabric information.